When you learn a family member has Alzheimer’s, you are likely to have many questions. Everything from getting your loved one the proper healthcare to determining where he or she can live safely may need to be determined. Many people combine home care and Alzheimer’s support as a first and long-lasting step in helping aging adults diagnosed with Alzheimer’s live comfortably and safely. A disease caused by nerve damage in the body, particularly in or around the brain, Alzheimer’s disease is characterized by memory loss. It is a progressive disease that advances in stages. For some, Alzheimer’s disease is experienced for just a few years; for others, a few decades. The disease typically occurs in people over the age of 65 and is more prevalent in women. Since the early stages of Alzheimer’s primarily affect memory, mood, and self-care, the disease often requires only limited medical assistance. Aging adults living with the disease do not typically need medical services on a daily basis. However, due to the multitude and variety of common Alzheimer’s symptoms, aging adults with the disease may not be safe living at home all alone. 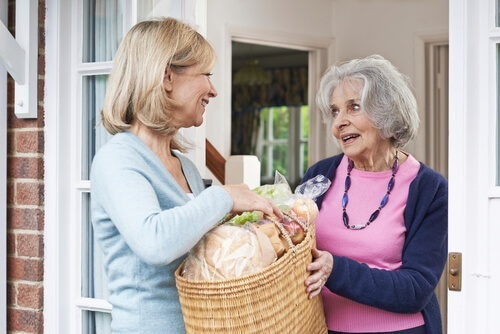 Intended to help aging adults enjoy the independence and comfort of living at home, home care exists to provide non-medical support in the home. Some families opt for part time home care services. Others rely on caregivers to fill in the gaps when family members are not available to support senior loved ones. Many families employ full-time or around-the-clock caregivers to keep their aging family members happy and safe at home. What Kinds of Alzheimer’s Services Can Home Care Provide? The specific services your family member needs are likely to change and expand over the course of the disease. For example, during the early stages of Alzheimer’s many families use reminder services to ensure safety and health despite increasing forgetfulness. If a loved one is no longer able to drive, transportation may be added to needed services. Should self-care become an issue, personal care assistance may be selected. What are the Benefits of Home Care for Those Living with Alzheimer’s? One of the main benefits of home care for those living with Alzheimer’s is that the services can be adapted to meet individual needs, even as needs change. Families supporting a loved one with Alzheimer’s often report that home care is important because of the peace of mind it provides the family while enhancing the quality of life for seniors. Through the assistance provided by caregivers, many adults with Alzheimer’s enjoy the comfort of their own home even as they struggle with the safety and health issues that can result from the disease. Learn more about the benefits of home care for seniors with Alzheimer’s. Download our FREE Guide to Home Care.